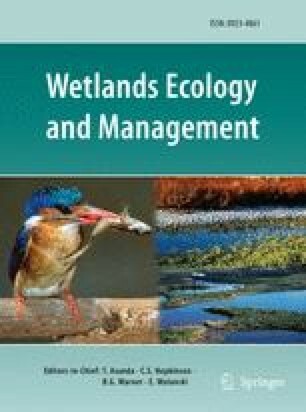 Ecology and management of Melaleuca quinquenervia, an invader of wetlands in Florida, U.S.A.
Invasive weeds are potent agents of environmental change. Wetlands are valuable environments that frequently are impinged by a variety of threats including invasive weeds. Melaleuca quinquenervia (Cav.) S.T. Blake (broad-leaved paperbark), though experiencing major diminishment of native populations in Australia, is naturalized and highly invasive in most wetland habitats of south Florida, U.S.A., where it infests more than 202,000 ha. Wetlands in south Florida, including such renowned areas as the Everglades, are being transformed into M. quinquenervia swamps, with major environmental and economic impacts. Current management methods include herbicides, mechanical or hand removal of plants, flooding, and prescribed burning. Insufficient information, high costs, non-target impacts, and the resilience of M. quinquenervia (trunk and root sprouts and massive canopy seed banks) greatly constrain the effectiveness of these control methods. Biological control offers long-term management potential, most likely by reducing the rate of spread and the vitality and growth rate of plants, thus rendering them more vulnerable to other environmental stresses and control methods. The leaf weevil Oxyops vitiosa Pascoe, a natural enemy of M. quinquenervia in Australia, will likely be the first biocontrol agent released against the weed in Florida. More information is needed, especially ecological data, to better understand the invasiveness of M. quinquenervia in Florida and to facilitate its management there.